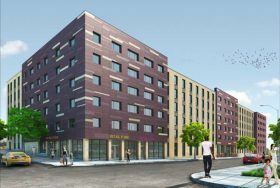 Construction began in 2015 for the Stone House at 91 Junius Street, a six-story, 161-unit building on the border of Brownsville and East New York. The supportive housing initiative comes via nonprofit Win, the largest provider of shelter for homeless families in New York City, who run two shelters just to the north of this site, according to CityRealty. The Stone House will reserve 96 units for homeless families and 64 for low-income households earning 50 or 60 percent of the area media income. The latter group has now become available through the city’s affordable housing lottery, with apartments ranging from $670/month studios to $1,224 three-bedrooms, all of which have access to the building’s offerings such as ground-floor retail, on-site laundry, a community room, outdoor playground, and on-site social services.